Anytime there’s a new artisanal coffee gadget, elaborate $10,000 brewer, or bean fad, everyone always asks me about it because I’m a big coffee geek. Try this just once, with only 2 Tbs of butter, and have nothing else for breakfast. You will experience one of the best mornings of your life, with boundless energy and focus. It’s amazing. It’s hard to wade through the Bulletproof Exec site network and figure out the whole picture of who they are, what they’re selling, and what evidence they have to back up their claims. 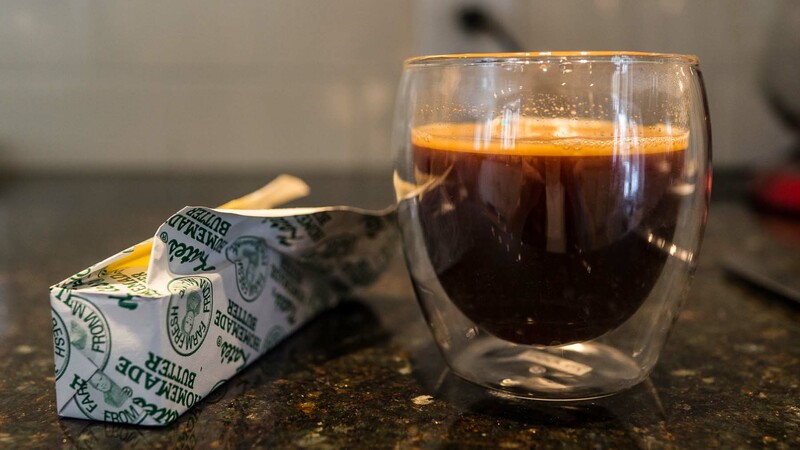 As far as I can tell, it’s just coffee with butter added (optionally with MCT oil, which I don’t have), and the site is mostly written and run by Dave Asprey. I’m skeptical of all claims from people who believe in or peddle pseudoscience and quackery,2 but for you, my dear readers, I actually bought a stick of unsalted, happy-cow butter3 and risked this morning’s coffee — a fine Kenya I roasted two days ago, wet-processed to avoid mycotoxins — to test this for you. Asprey’s recipe is 2 tablespoons of butter for 17 ounces of coffee, which is more caffeine than I can handle in the morning, so I made roughly a third of it: 6 ounces of coffee (AeroPress-brewed from 9 grams of beans), and about two-thirds of a tablespoon of unsalted butter. Butter does not dissolve into coffee. It melts and floats on the surface in a thick, oily layer. I kept stirring it and swirling it around so I wasn’t just taking sips of butter off the top, but it was a losing battle. It tastes exactly how you’d expect: like drinking a butter sauce with a light coffee flavor. It was hard to get through, feeling and tasting mostly just like butter. It makes for the creamiest, most satisfying cup of coffee you’ve ever had. It will keep you satisfied with level energy for 6 hours if you need it. Hunger-wise, it kept me satisfied for a couple of hours. Admittedly, I didn’t make his full recipe, so maybe the full 2 tablespoons of butter would have lasted longer. I usually eat a light breakfast, so this was good enough to address hunger. But it left my lips feeling oily all morning, and it completely ruined my coffee’s flavor. It looked gross, felt gross to drink, and left a gross layer of oily fat to scrub out of the mug. If I want to experiment with eating a low-carb, high-fat breakfast again, I’ll pick a different method. I don’t recommend trying this. I can’t find a good reference for average steam temperature from an espresso machine, but I imagine it’s not much higher than 100°C, and there’s no way brewing an Americano can bring the coffee up to the steam’s temperature. So Asprey’s claiming that brewing coffee somewhere below its boiling point of 100°C breaks down the toxins, but roasting doesn’t.